You can watch video of the whole discussion on Facebook, here. If you’re a medical provider, organizer or attorney interested in getting involved with our medical providers’ network, then please, email Lauren Quijano. NYLPI’s Medical Providers Network connects migrants in the removal process with doctors who can help advocate for their status to stay in the country, on the premises of malpractice by the healthcare providers in the detention facilities. It’s a multi-prong program that works closely with immigration lawyers and community based healthcare providers. You can find out more about the program here. The combined efforts of physicians, lawyers and community-based advocates are needed to address the lack of access to medical care for immigrant detainees in the U.S. There are about 440,000 immigrant detainees across the country, and reports from the U.S. Department of Homeland Security and other entities have raised questions about whether many of these individuals are receiving adequate care for acute, chronic and mental health conditions. In New York, areas of concern have included lack of access to blood pressure medication and pregnancy care, according to the New York State Health Foundation. 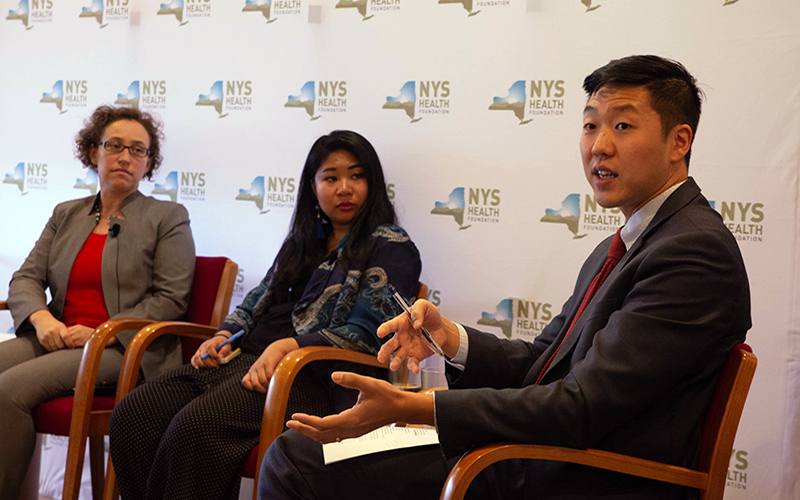 “I still think none of us really know the scale or the size of this,” said Dr. Joseph Shin, co-medical director of the Weill Cornell Center for Human Rights, speaking at a panel discussion hosted by New York Lawyers for the Public Interest and the health foundation Thursday. But, he said, working with community and legal partners can aid in better understanding and addressing the dangerous problem. Shin said he and other physicians are working with immigration lawyers to gather evidence, such as previous health records, evidence of trauma or untreated conditions in detention facilities, and mental health evaluations. “Our role is to be able to educate the courts,” he said. Lauren Quijano, community organizer for the health justice program at the New York Lawyers for the Public Interest, said she is now working with about 60 physicians to address the issue and raise awareness of the conditions in detention facilities. Dr. Shin said: “The detainees suffer from illnesses like preventable chronic medical conditions. This care is denied to them and when left untreated, the cases become more severe as opposed to if they were given the proper medical care when they were first diagnosed”. Many migrants suffer from conflict trauma from their home country, during their migration to the United States, and when they are picked up and taken through the immigration process. Physicians like Dr. Shin work with immigration lawyers to gather evidence of trauma from their home countries like scars, broken bones, and untreated mental illnesses like PTSD. When people in immigration detention are placed in solitary confinement and mental illnesses are left untreated, it can lead to the detainees committing suicide. In order to get the community involved and help advocate against the deplorable conditions that detainees face, Ms. Quijano said, “the shock value would have to have some kind of familiarity to get people to get involved. I believe the egregious conditions will shock people, and sadly the shock factor today for getting the community to rally behind a cause is a story like the children dying on the border,”. Reactions from the audience about the panel were positive. 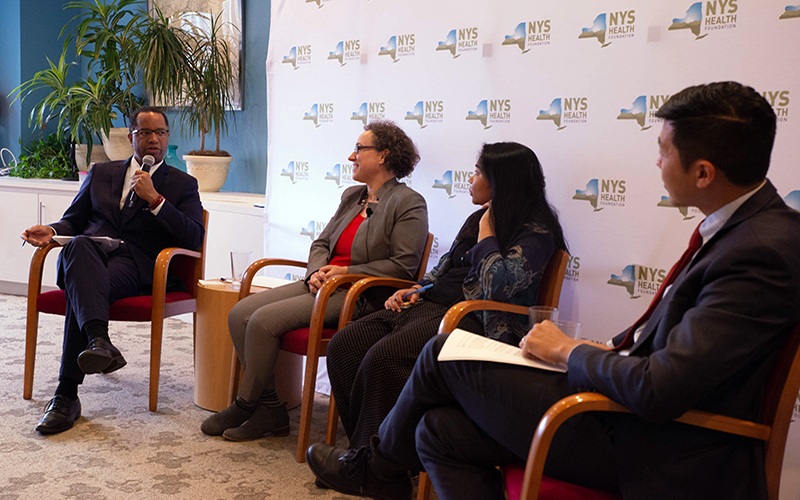 The event was also recapped by the New York State Health Foundation. American Medical Association Spotlights NYLPI’s Medical Providers’ Network Our groundbreaking work to provide better medical care to people in immigration network has drawn the AMA's attention.